As a special THANK YOU for joining us in welcoming the new team this week, you can use the promo code "letshavefun" at checkout for 20% OFF your ENTIRE stamp purchase!! You can't be new to using Copics because your coloring is amazing! What an adorable blue crab. Great job on him and your background. Way too cool! Wow I love all your projects!! I just love the blue crab. Hehehehe I lalalalalove em! I wanna be shellfish and keep em all to myself!!! Who could be blue with a cute little guy like that? He is adorable! Love the coloring! Can you see my smile? I love your whimsy along with your amazing talent. This is just so cute and I'm glad you're loving your Copics. I must admit, my pencils are gathering dust on the craft shelf because I LOVE coloring with Copics. your card is sooo cute! omgosh, you card is sooo cute! amazinf coloring, too! my style is all over the place! lol depends on my mood! :) happy to be a new follower! Can I just say that is the most adorable blue crab ever??!! Your coloring skills are incredible...he literally jumps off the page!! And HA...I love that sentiment!! What an amazing, whimsical, fabulous card, just like you, my sweet friend!! Soooo adorable!! Love the crab! :) Too cute! 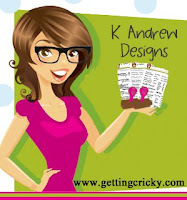 I love my K. Andrew Stamps too Sam I am! ;) This crab would defiantly wipe my blues away. He is adorable Amy. I love the way the copics color him in. Love it!!! I just signed up with my email :) I got Splashtastic Summer in the mail today and can't wait to use it. I love your nightlight! I think you forgot to mention that you like Dr.Seuss!! 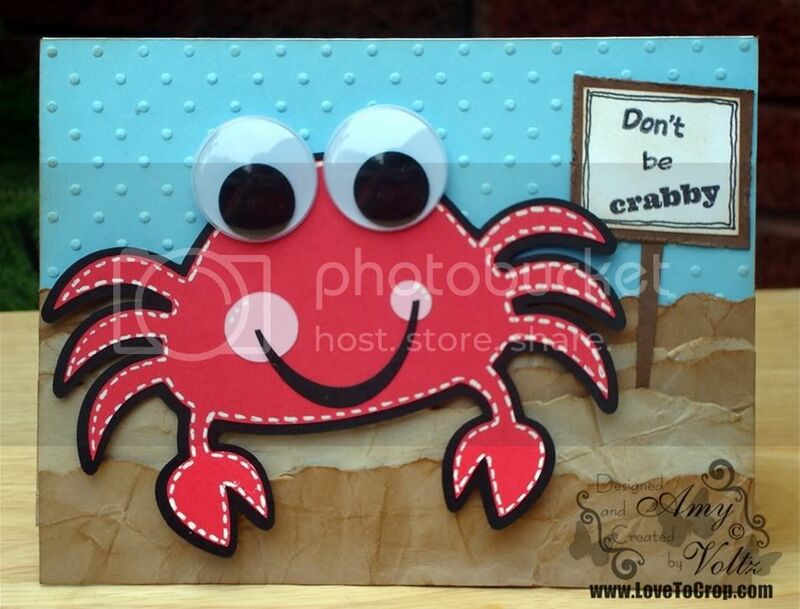 I find it kind of funny that you have done so many projects with crabs on it when you are anything but crabby! Love the card you made!! I just love that you love crabs! This card is so cute & the sentiment is absolutely perfect! You did a fabulous job on the coloring too! I love your whimsical style. You make me smile. I don't know what style I am. I guess I'm the "craft-on-the-fly" style - lol. Whatever pops in my head is what I do. SUper cute projects! I already subscribe via email, follow your blog, and "Like" your FB page. Guess I've been stalking you awhile lol. Hi Amy! Your card and Blue Crab is such a cute little crustation. Great coloring job. He's perfect for a Wobble. I just love this challenge. Will make sure to get by more often. Love your work. OMG! This is too cute. Love the crab He is blue-tastic. A new word I made up. Such a cute card! As for my style...I tend to gravitate towards cute and whimsical, but I do love dabbling in other styles too! Love your cards, the colors, the sentiments! I am not one to do cards altho I should, I have plenty of scraps that I could use up for sure! Maybe when I get the scraproom up and running I can try. As for style..I have no style! lol I just go with the flow at the time..
Oh wow! Your cards are so cute! I can totally see your whimsical style. I think I am more of a clean and simple crafter myself although I do like to mix it up a bit. just became a FB follower. became a follower of the blog! am now an email follower as well. hey Amy... once again your stuff is amazing!! Any of your projects would cheer the grumpiest of grumpies up and day any time!! Cute crab cards. Perfect coloring for the sentiment. Thanks for giveaway chance. Wow you were busy. I love the blue crab. He is so cute. My Style is several different crafting personalities. Its just what im feeling at that time. Thanks for the chance to win. I like you FB Page! Thanks for the chance to win. TFS AJ! I subscrib to you email. Thanks for the chance to win. TFS AJ! Im a new follower of your blog. Thanks for the chance to win. TFS AJ! And you have me for a life time. LOL I'm a follower of your Networked Blogs! Thanks so much for the chance to win. TFS AJ! Super fun card. I love your little blue crab ... and all your other crabby posts. :) Thanks for sharing your style. -- My style is all over the place but probably simple is where I tend to go most. What an adorable card, I am sure it would bring a smile to the person who receives it. Thanks for sharing. Ha ha... 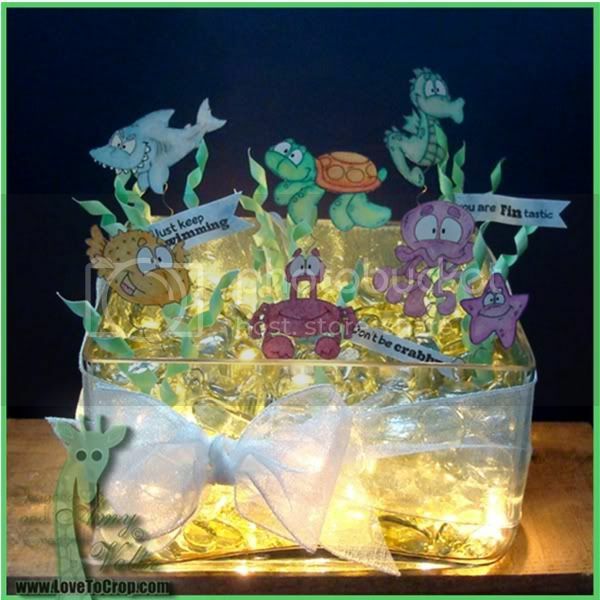 I just love your fun little sea creature projects! Awesome designs! As for my style, I go one of two ways. Either I'm all for vintage distressed styles with lots of detailing, or simple and clean styles. Already a fan of yours on FB! Amy - I LOVE your style - you always inspire me. It is such an honor to know you, my friend and to be on this design team with you! copics are really on my wish list now. and i love the stamps, well the crap is just too too cute. 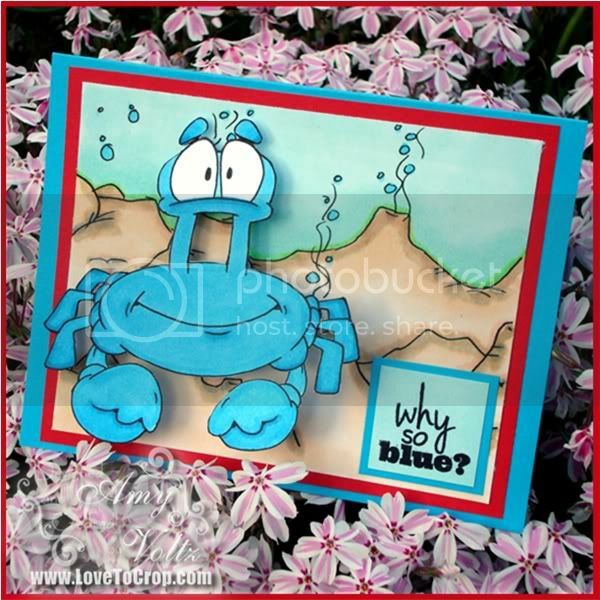 I love the blue crab and cute cards and projects. You have outdone yourself. Beautiful. What a cute card. Just love your blue crab. My style is simple but I do like to try other styles to see if I may like. I'm a follower of your blog & networked blogs. and Wow, Amy your coloring looks fabulous! Wow WOW WOW.. Okay need stop shouting to you! I am a new follower.. and my style is EVERYTHING.. I love colors, Vintage, Simple,..You did an awesome ob coloring with your new Copic markers.. I must say your card is so cute.. that card will def. cheer someone up in a heartbeat! When I first saw your crab i smiled .. Thanks so much for sharing your work.. can not wait to see more! wow!!! Love your projects, beautiful!!! WOW, these are just adorable! Love the blue crap especially!! Adorable crabs...just so cute ! I think they'd cheer just about anyone up. My own style is usually clean and simple but I do experiment with others at times. Thanks for sharing yor project. I'm still smiling even though I can't see the crab...better go back for another look ! Your work is absolutely amazing. I have been a fan of yours for quite some time. I am already a follower on your sites. Thank you for sharing your inspiration and creativity with all of us. I am trying to expand my horizons with my scrapbooking projects, so thank you for sharing your ideas. My style has been kind of crisp and clean with a tad of shabby chic. But, I am now loving vintage style, and Tim Holtz products. I guess my style is a little bit of everything depending on my mood, and what or who I am creating for. 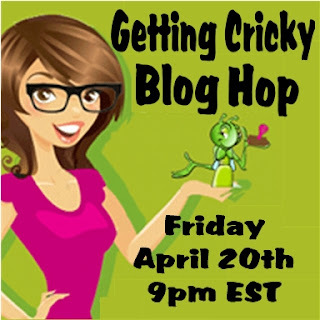 Thank you for this super fun blog hop. Love your creations, especially the night light! My style is quick and easy, whatever that ends up looking like. The quicker the better. Love the crab! and your coloring great job. I just email subscribed too! Oops forgot to tell you my style. I like clean and simple but w/ bling! WOW wow WOW!! Absolutely amazing! As always, LOVE what you do! You always amaze me with your projects. OMG Amy this is just adorable! Hi Amy my Love, your blue crab is adorable just as adorable and sweet as you are. I do believe he does show your quirky funny side. You have a marvelous sense of humor which is reflected in lots of your projects. You also have a sappy side that I love, like when it has to do with family or soldiers, or friends. You are such a creative person, with a huge heart. You are one of my favorite people. 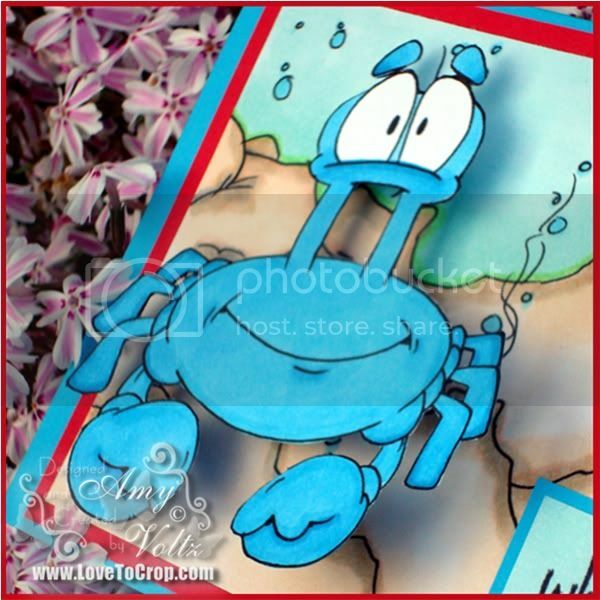 Cute card, love the color blue you used for the crab. The night light aquarium is truly a work of love. My crafting style really varies, I'll try any style that inspires me! OMG, soo cute. I love the way you colored the blue crab. The red crab is cute also with the google eyes. I just LOVE your work Amy! It's always such fun and absolutely wonderful! I would have to say that my style varies, but no matter what I always like my projects to be fun! 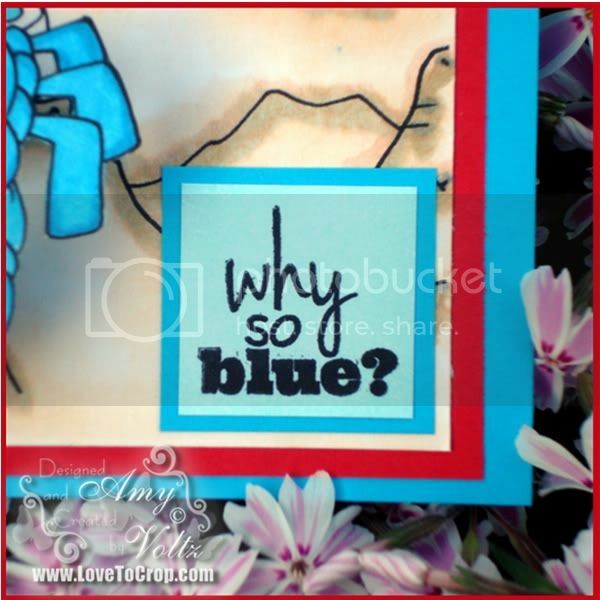 Such a cute card; it's sure to bring a smile to whomever receives it and help them get out of their blue mood! My crafting style is a bit mixed; it depends on what and who I'm making it for, and how much time I have. Usually it's more toward the clean and simple side, but then with time (if there is some -- usually a few days later) I end up adding more (or some) bling, etc. Thanks for the chance to win. Awesome card Amy! Your crab is so cute and your coloring is AMAZING!! Seriously, I need to learn how to use these copics better:) Such a FUN card!! Amy, I absolutely LOVE your blue crab! He is adorable! Thank you so much for sharing him & your other whimsical projects. They made me smile! So now I'm starting to feel stalker-ish as I'm telling you that I also follow your blog...but how can I not? You are awesome! Love your blue crab! He would make me smile in an instant! My style is all over the place, it is whatever I fancy for the moment. What a great card! My style is pretty much clean and simple, but sliding more into exploring some other styles! I love your blog and have been following for quite a while. All of your projects are adorable. Wonderful job. This is so amazingly fun. I love this crab. I was trying to find him in the set so I could possibly get it. I did snag some cool freebies. I love you style chica! Great job! TFS and being apart of this wonderful hop. Not sure my last comment went through since I walked away for a minute and the baby girl decided to play around on my keyboard. Your blue crab is quite whimsical....just like you. Happy to be hopping and you already know I am a fan here, FB, email...all over! Ohhhhh Amy, this is the cutest!!! I love it!! I don't really have a specific style but I do love vintage lately!! WOW!! I love your projects, and especially that blue crab :) I have a whimsical style also.